The connection between the divine and the domestic—simultaneously harmonious and complicated—is thoroughly embedded in our society. Using the shared etymology of the word “home” in Hebrew and Arabic as a metaphorical framework, Aharoni explores the complex and interwoven interaction between men, women and God via modified sacred texts. 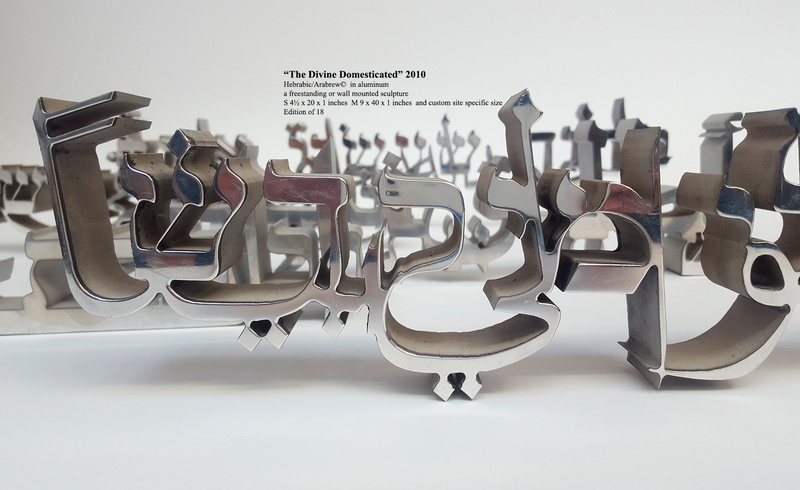 The phrases, in which Aharoni fuses Hebrew and Arabic, is legible in each language—and the intertwined characters also form a new phrase in Hebrabic/Arabrew© calligraphy. This linguistic hybrid is both iconographic and enigmatic, and in turn becomes an invitation to contemplate each phrase’s meaning as well as its larger significance. This shift of the phrase’s intent from denigration to veneration surveys the humanity (with its inherent flaws) in divine and domestic interactions, and asks us to consider the complex and often contradictory forces extant in all relationships.